Instead of the three separate interviews recommended by Schuman, McCracken recommends one long interview. The first step of the long qualitative interview begins with an exhaustive review of the literature. aids in the construction of interview questions. The second step involves a self-examination. “distances” the investigator. “Only by knowing the cultural categories and configurations that the investigator uses to understand the world is he or she in a position to root these out of the terra firma of familiar expectation. This clearer understanding of one’s vision of the world permits a critical distance from it…The investigators experiences and biases are the “very stuff of understanding and explication” (p. 32). 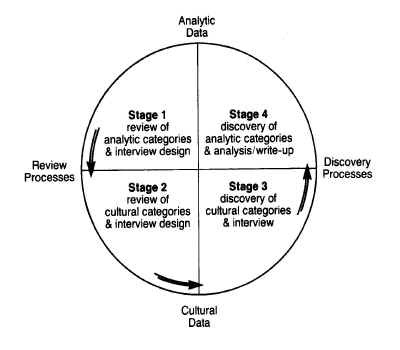 The third step involves developing a questionnaire. The fourth and final phase of the long interview is the most demanding. It is the analysis of the data. …..McCracken, G. (1988), The long interview. Newbury Park, CA: Sage.